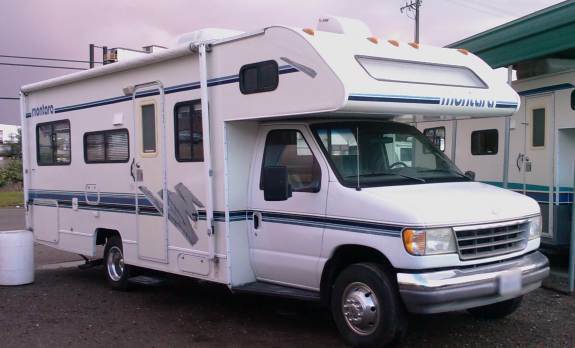 Today (12-13-09) we join the big guys by purchasing this RV for our 2010 and beyond bbq competition season. We're saying goodbye to those 110 degrees comp weekends. We've dutifully christened her "The Rub Boat". We rented a similar model earlier this year for the brutal Fairfield triple header weekend. Three KCBS competitions in one weekend, we knew that cooking all three would be brutal and so decided to rent. It worked out well, made getting a few hours sleep more possible, and brought a lot of comfort to an otherwise physically demanding weekend. Our next competition would be Clovis with just our Pickup truck, and trying to get some shuteye in the bed truck. And boy was it hot it reached 110 in the shade under our canopy. That sucked. No more of that jazz - this low mileage baby (32k) was on Craigslist for under $17k at a dealer outside Lathrop Ca. It will easily hold it's value while we own it and should be a lot of fun.